Although I am the kind who will be super happy to eat a simple meal of rasam, vegetable and rice, a chutney would take it to another level. A spicy, fiery one, even better! If you are familiar with the cuisine of North Karnataka, chutneys are common as part of the lunch menu. And when I say chutneys, I don't just mean the kind which are eaten with idli /dosa. The ones which go with rice and chapatis / jowar rottis are another large bunch altogether. Among those commonly made during festivals, functions and community gatherings is Habbada Chutney (translating to festival chutney) or Kadalebele chutney. 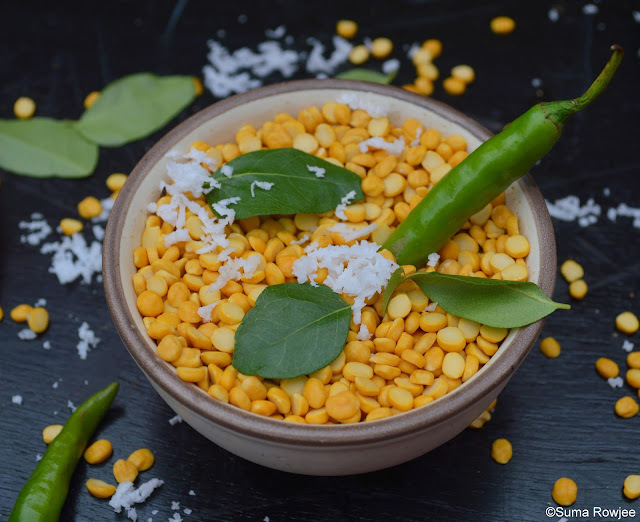 Kadalebele chutney is a finger-licking good one yes, but only if you like the taste of the uncooked chana dal. If you can't tolerate spicy food, you are better off not making this one as it will be bland and tasteless. With barely any ingredients, the heat from the chillies, the slight tang of the tamarind and a generous dash of hing are absolutely necessary. Another necessary and welcome addition - a trickle of melted ghee on your rice! Procedure : Wash and soak the Bengal gram in enough water for at least 4 hours. You should be able to pinch it easily with your nails once its soaked. Drain completely. Grind together the soaked Bengal gram, fresh coconut, hing, chillies, salt, turmeric and tamarind. Use very little water to grind, you can add more water later to adjust the consistency. The chutney must be coarse and not completely smooth. 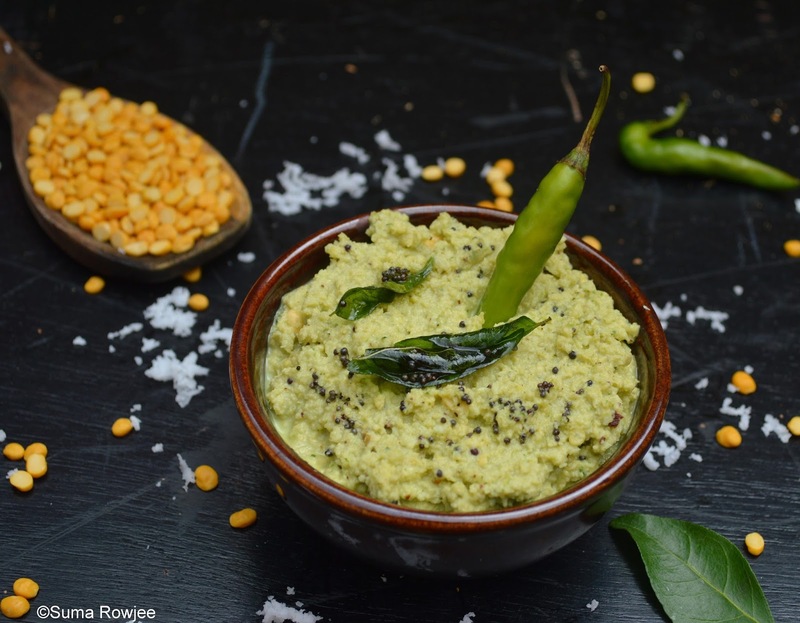 Bits of green chillies here and there make the chutney more appealing to the taste buds and the eyes too! Transfer the chutney to a small dish. Heat the oil, add the mustard, allow to pop, add the curry leaves. Take off the heat. Pour it on the chutney and mix. Serve with hot rice and ghee. Please note: You could use varying amounts of coconut in the chutney. Some people prefer lesser than what I have given, so please don't tell my mother. If you add more tamarind, the chutney will be tangy and I would not prefer this as there is no jaggery to balance out the taste. Kadalebele chutney goes to the 61st edition of My Legume Love Affair, a very popular event started by Susan of The Well Seasoned Cook, Its now being carried forward by Lisa, hosted by Aparna this month. Dishes with fresh or dried beans, lentils, pulses, and/or the sometimes edible pods that contain these seeds, and derivative products like tofu or besan, along with tamarind, fenugreek, carob, peanuts are all acceptable says Aparna. But legumes have to be the star ingredient here. You may not want to miss this event as there are also three prizes to be won, including a copy of Bong Mom's CookBook! The event is on till 31st July. Please visit Aparna's blog for more details. 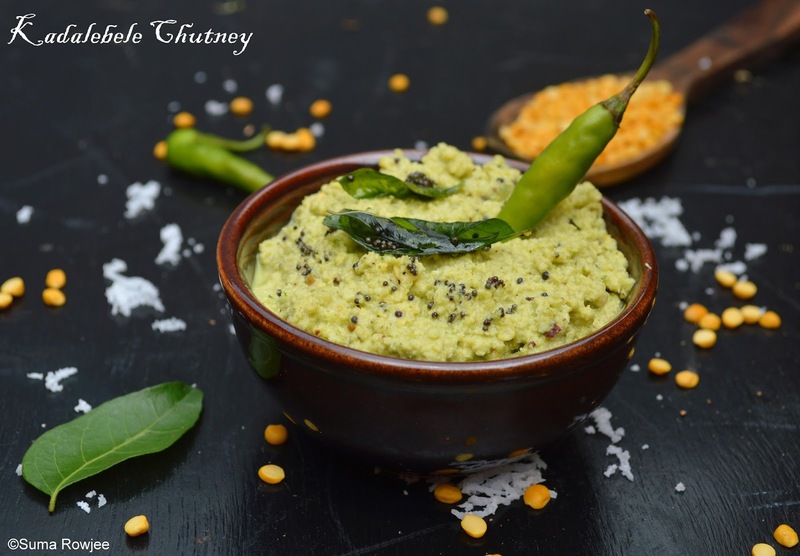 There is another version of this chutney where the Bengal gram and other ingredients including dried red chillies are roasted. Hope to post that sometime. very traditional and tempting chutney.. looks yummy!! Gonna try it right away! I love the colour of this chutney. 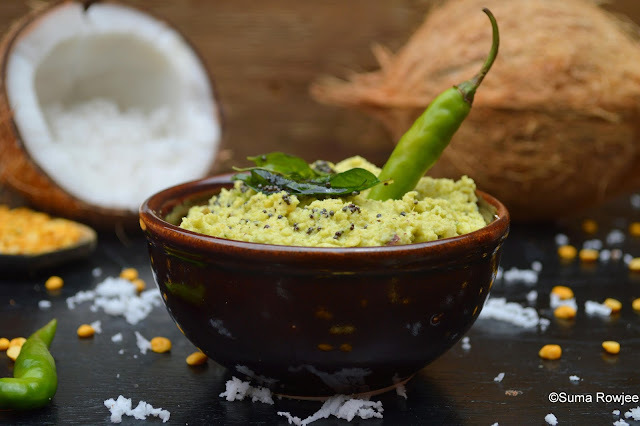 We make a similar thick chutney with dal but the proportion of coconut is more than the dals. Must try this one. Thanks for participating in this edition of MLLA. I relate to this chutney as it fills me with nostalgia... of my grandma's cooking... of Amma's feast during pooje and festivals... I need to make this one soon to revive those memories. Lovely clicks Suma. Love the first snap. Its sharp and nice. Tartine's Clafoutis - With Plums!